This baked chicken dish is easy to prepare and tastes like sweet, sweet summer! 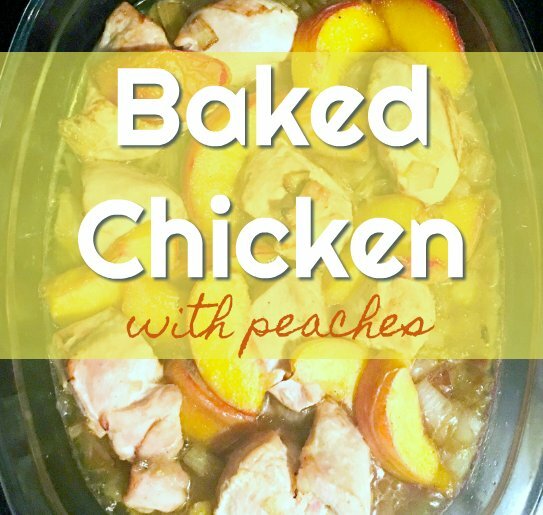 Baked chicken and peaches together in sweet harmony! Wish you could smell this dish! I’m staying at an Alabama cabin for a week. I don’t want to eat out every night but I also don’t want to slave in the kitchen while on vacation. Also, there’s a lack of equipment – one cutting board in the joint and not a measuring cup to be found – not to mention, ingredients limited to basic spices and groceries we brought with us. Despite all this, I prepared a baked chicken dish the other rainy night that my family declared, “AMAZING” and so I’m sharing it with you so you too can do very little and hear accolades from your family. You’re welcome in advance. 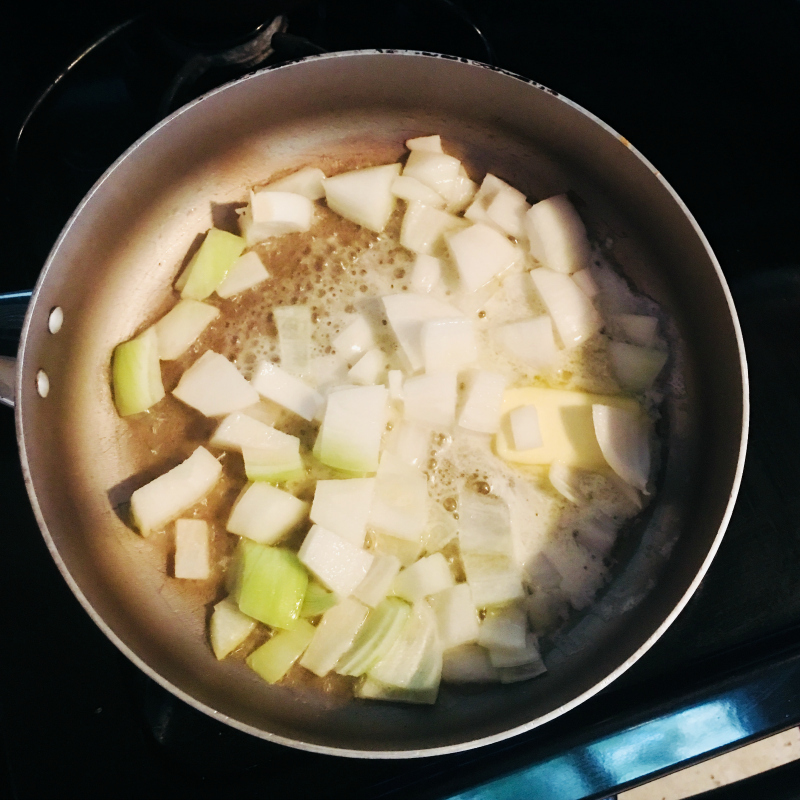 I started by chopping up half a large white onion (I like white onions because they’re sweeter, but you could use any onion) and sauteing it with half a stick of butter – that’s 1/4 cup for those who get their butter in one-pound blocks. I cooked the onions and butter in one of two small frying pans available! 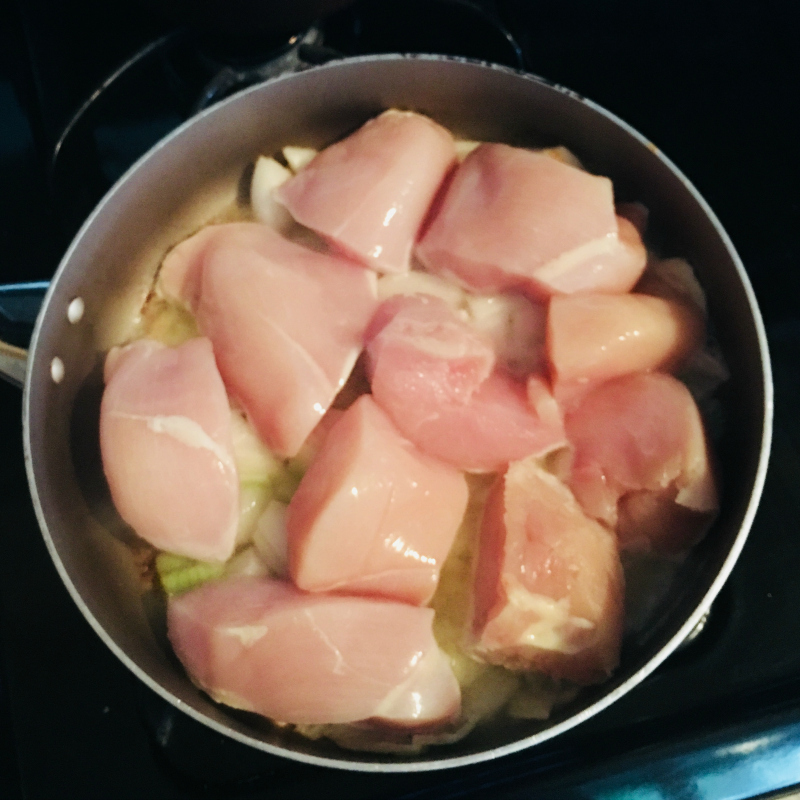 After I got them going, I cut three large chicken breasts into large chunks then added them to the pan to brown. Sizable chunks of chicken getting browned before going in the oven. 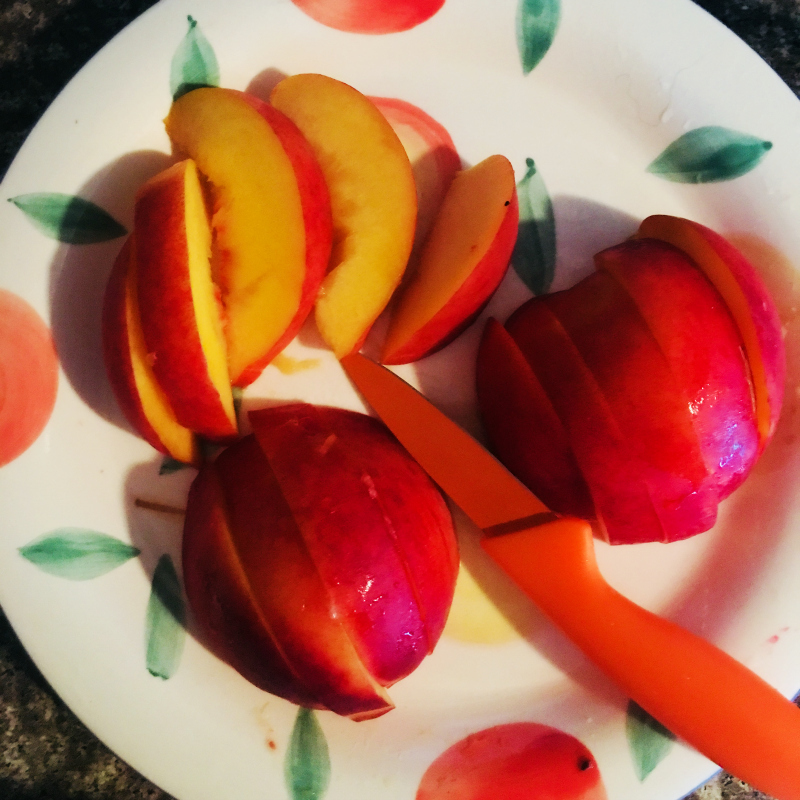 While the chicken was browning, I sliced up 1 1/2 large peaches… on a plate since I had used the one cutting board for the chicken and didn’t feel like washing it. No cutting boards but a plate with a peach pattern! 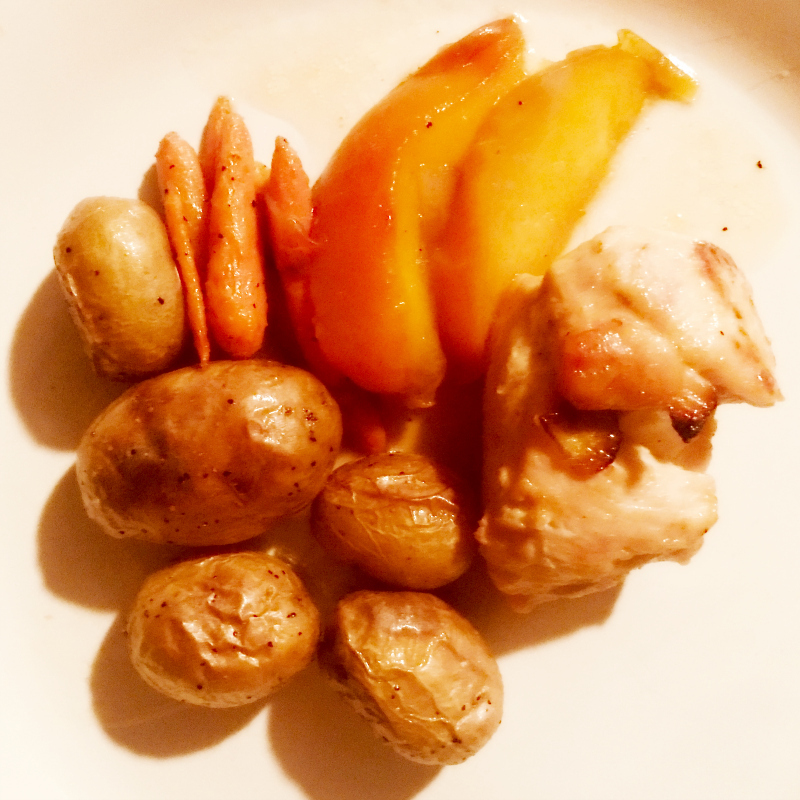 Before starting the chicken, I had tossed small potatoes and carrots in vegetable oil with some salt and pepper and put them in the oven to roast for a side dish. 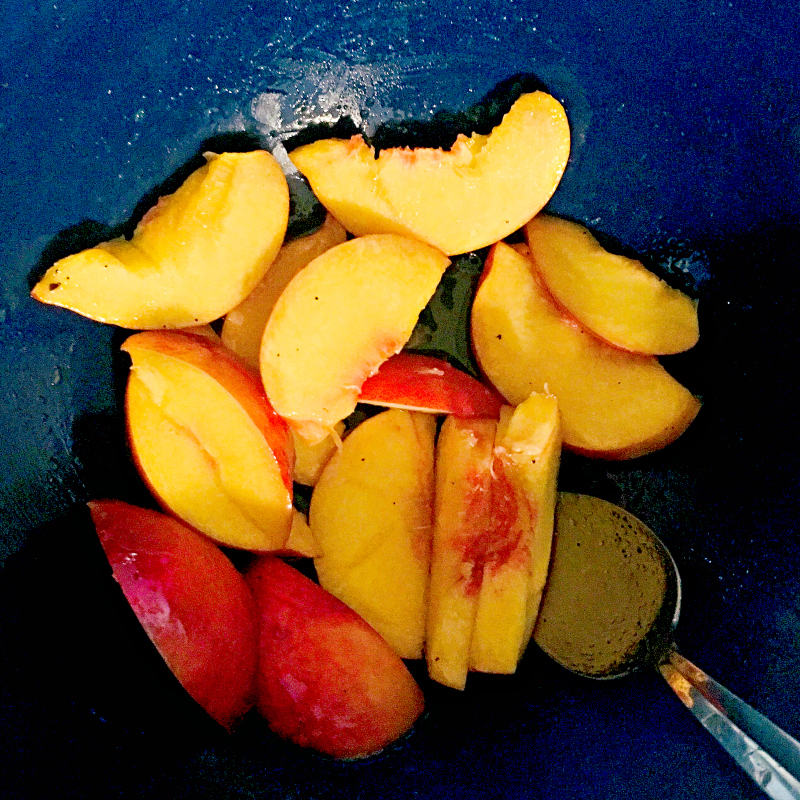 Because I’m lazy about dishes, I used the same bowl and tossed my peaches in what was left – just to give them a bit of salt ‘n peppa. 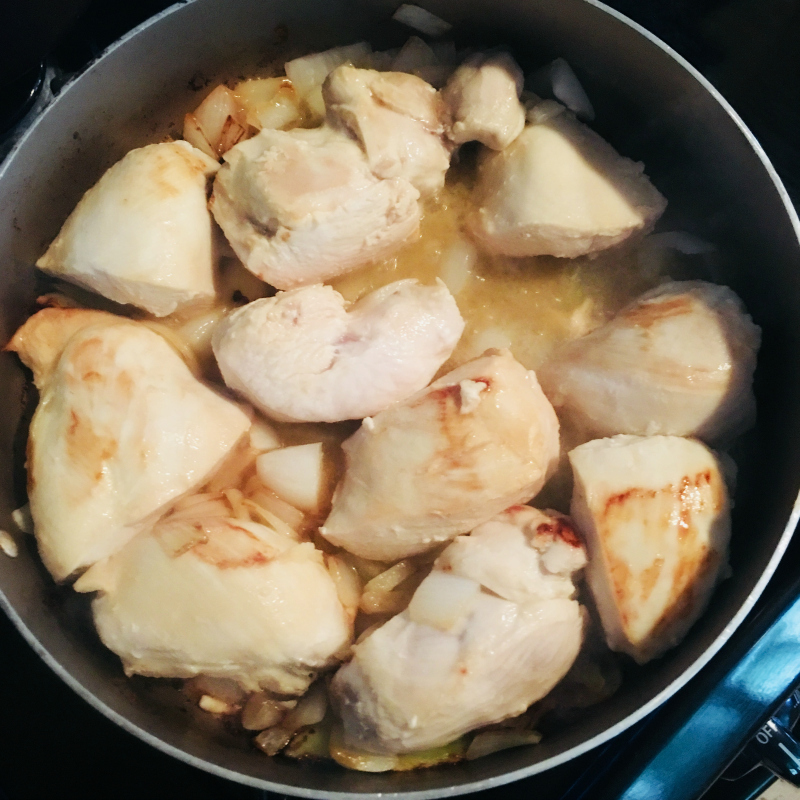 Once the chicken was lightly browned, I put it along with the onions into the one baking dish in the cabin. I wasn’t aiming to cook the chicken fully, I just wanted a nice golden colour to them. I used Sortilege because I never travel without it, but it is not available in the US unless you’re friends with me. 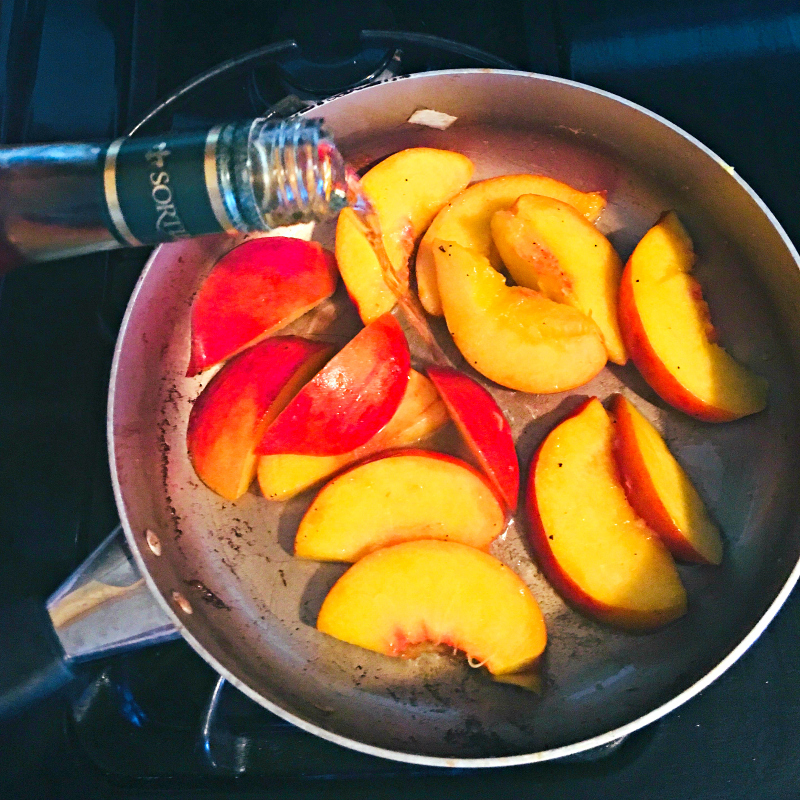 You could substitute another maple whiskey, regular whiskey or peach bourbon which you should have if you live in the South! I added 1/2 tsp garlic powder and 1 tsp Creole seasoning for some savoury contrast to the sweetness. 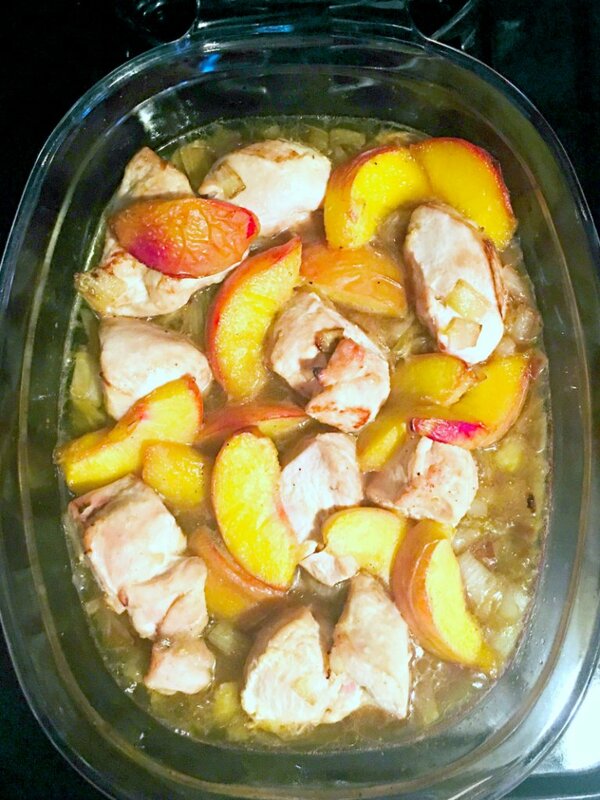 I let the peaches cook for a couple minutes then added them to the baking pan with the chicken. Time to bake! Since I had already browned my chicken, I baked my dish for 25 minutes at 350 degrees. If you skipped that step, increase the baking time to 40 minutes. Some say you can get away with less but it depends on the size of your chicken and since this dish is baked in juice, you won’t dry the chicken out if you bake it a little longer. You could use chicken with bones in this recipe in which case you would again increase the baking time to 45 – 60 minutes depending on your level of raw meat paranoia. If you really want to be sure, use a meat thermometer and ensure the internal temperature of the meat reaches 165 degrees Fahrenheit. I am going to be upfront and confess I never do that, but my hubby checks the temperature when smoking large cuts of meat so if I was checking meat temps, I’d make him do it! Ah marriage! 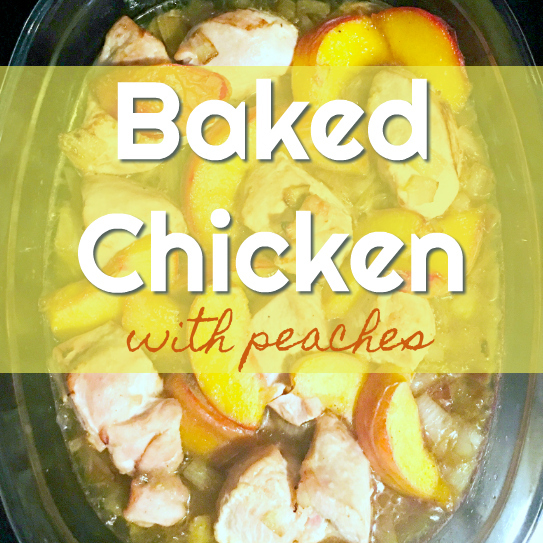 Fresh from the oven, this baked chicken with peaches smelled incredible! It was already dark (we eat late on vacay) so I couldn’t get a picturesque bay shot of this meal. 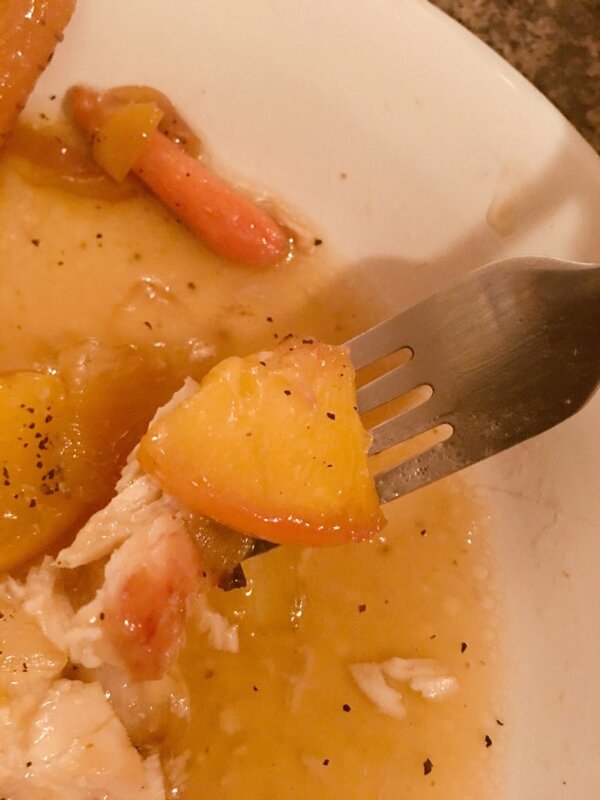 The peaches were soft but not falling apart and the best bites had a bit of chicken with a bit of peach! YUMMY! All of my kids gobbled up this baked chicken dish – even my picky eater! Now that is amazing! I am happy that I was in the summer cabin forced to be creative because I came up with a recipe that is sure to become a family favourite! Hope you try it and enjoy it! This baked chicken dish is easy to prepare, smells like summer and will leave your family exclaiming "AMAZING!" Add to frying pan and saute while cutting up chicken. Add to pan and brown for about 10 minutes. Once browned and onions soft, put into baking dish. Toss in a bowl with 1 tsp oil, salt and pepper. Then add to chicken pan. Add to chicken pan and cook for 2-3 minutes till hot then add to baking dish. 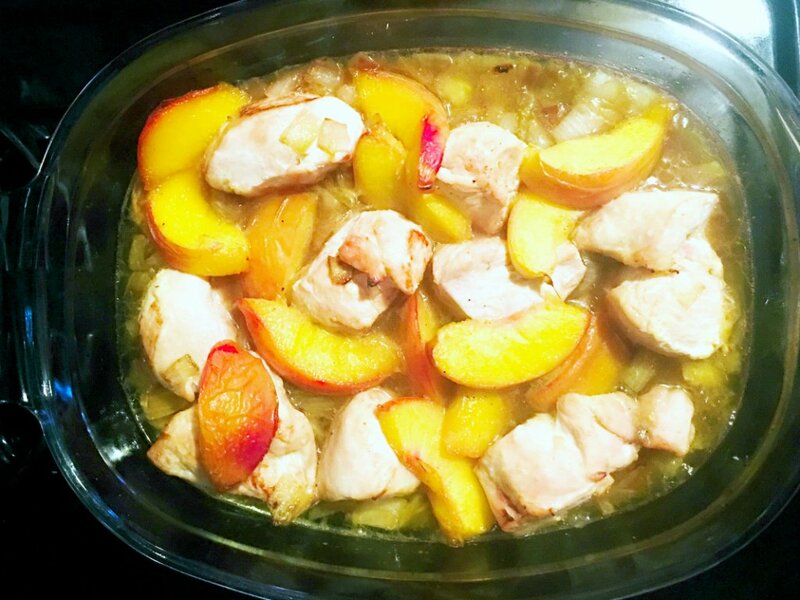 Bake chicken and peaches at 350 degrees for 25 minutes until hot, bubbly and aromatic! Serve with roasted veggies or rice to soak up the yummy juices. Wait for children to exclaim "AMAZING!" Thanks! It’s cozy yet summer-y! (Helps to have AC!) 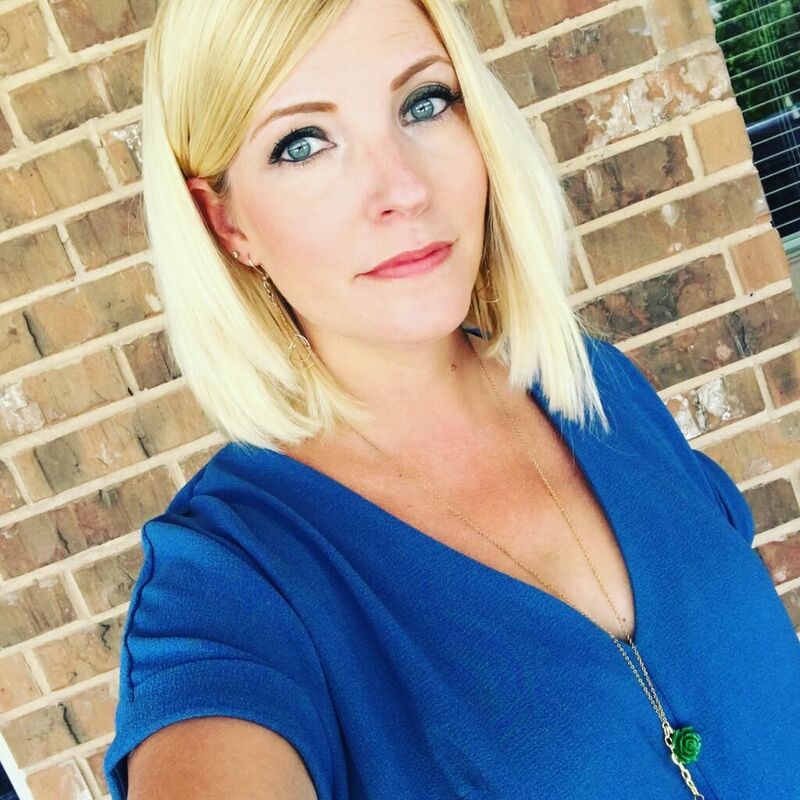 It’s plenty hot here – I almost perished yesterday in Pensacola at the Blue Angels practice!! Wonder if I’ll ever get used to it!